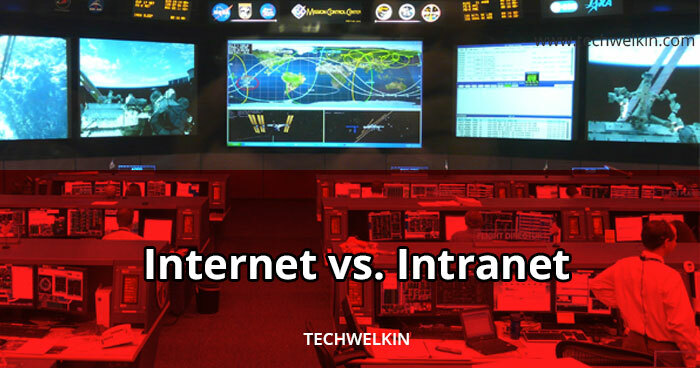 Learn the difference between Internet and Intranet. This article provides details of both the networks and also lists similarities between the two. All of us are familiar with the term Internet and many of our readers must have heard about Intranet. People often feel confused between these two terms and wonder what are the differences between Internet and Intranet? Today, in this article, we will discuss the differences as well as the similarities between both. Internet is the World-Wide network of computers accessible to one and all across the globe. Hence the number of users is unlimited. You can access any computer if you are aware of its Internet Protocol address (commonly known as IP address). The IP address is a unique set of numbers that defines a computer’s location. We access a computer using a domain name like https://techwelkin.com. When you type this name in your web browser, the browser accesses a Domain Name Server (DNS) computer to lookup the domain name. If the name is found in the DNS, it returns an IP address — otherwise DNS throws an error message to convey that the name was not found. Once your browser has the IP address it can access the remote computer that is hosting the website. In simple words, an intranet is a set of networked PCs. Computers on the intranet network may or may not have access to the internet. Intranet is a private network maintained by an organization for the internal use of its own employees and members. 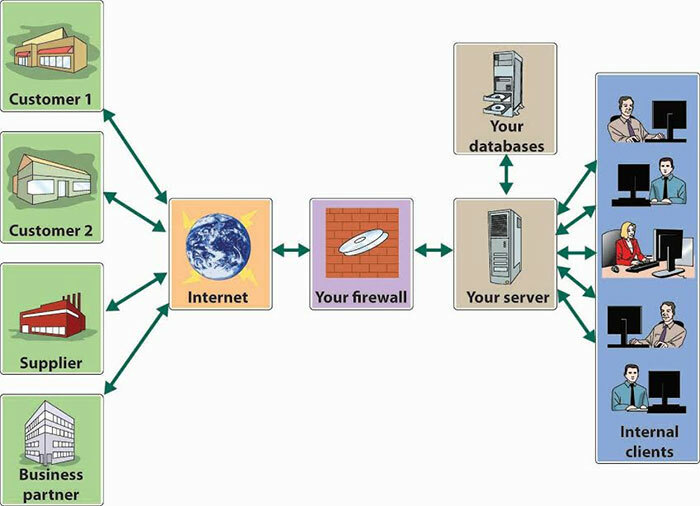 In case the Intranet network is connected to the Internet, the Intranet will reside behind a firewall to ensure security. For example, let us assume an office with a few PCs and a couple of printers. All these devices are networked together. On one of the PCs resides a directory of resources that are part of the Intranet. Other PCs on the network can access this intranet by pointing its browser to that directory, for example, X:\intranet\index.htm. After connecting, you can navigate the intranet just the way you would navigate the internet. The following image illustrates an Internet and Intranet. Intranet can be accessed through LAN or WAN. LAN requires a direct physical connection to access the network. But WAN can be accessed through a direct physical connection or a remote connection. Organizations with offices in multiple locations use WAN for intranet and allow password protected remote access using a dedicated communication line. We are now familiar with the terms internet and the intranet. Let us now take a look at the differences between the two. Internet is a wide network of computers and is available to all. Internet contains a large number of intranets. Number of Internet users is unlimited. Internet contains various source of information. Internet has commercial potential, that is, you can generate income from the internet. Intranet is a network of computers designed for a specific group of users. Intranet can be accessed from Internet with restrictions. Number of users is limited. Intranet contains group specific information. Intranet is a relatively safer network. Several people can share the data and the peripherals simultaneously over the intranet. It enables a business to manage the available knowledge within an organization. Intranet helps test offline websites for functionality before going live on Internet. It helps digital reference databases for looking up facts and figures, internal email systems and instant messaging software. The intranet is more of a business tool that keeps an organization connected in a structured manner. Both are constructed from the same type of hardware components, including routers, servers and data network cables. The two types of networks are based on the same network architecture and data-sharing protocols like TCP/IP and FTP. Intranet can work on any of the browsers. Intranet services can have its own messengers similar to the available popular internet messengers. Security features like firewall and encryption-decryption policies are similar in Internet and Intranet. Internet and the Intranet — both are important for an organization. The Internet helps businesses by creating opportunities for networking, information retrieval, communications, marketing, sales etc. The Intranet help an organization’s digital internal communications needs. It also provides a secure space for storing, accessing and developing electronic materials. We can access a part of the intranet over the internet from the credentials which we have been given from the organization.